Do you want that customized? A couple of weeks ago, we wrote about our bespoke work with curriculum development and business development. We offer customization to meet your team's unique needs. We will continue to see this bespoke trend growing in 2019. We have noticed in our work with clients that learners respond the best when the training is created with not only the end in mind, but with a focus on what will engage the learner. We are not into the 'one size fits all' mentality because it isn't effective. Learners, especially millennials and gen z's want companies to invest in training that is personalized and engaging. The idea of developing curriculum that is customized begins by gaining an understanding of who is in the room and what do we want to achieve. Simply put, we develop using a backwards model of thinking, meaning that we review the knowledge we wish to convey and then step back and analyze the learners to determine how best to convey said knowledge. Customization comes into play when we gather data on the learners, play to their interests, create pathways that allow a learner to go in a different direction based on interests, but with the same end result in mind regardless of which pathway was chosen. If we develop using this criteria, we will have employees that feel supported in the workplace and are incentivized to improve and develop. Coming Soon...Pre-Order Today and SAVE! What do we mean by bespoke? Our curriculum developers specialize in taking your own unique ideas, content, and desires and turning it into stellar courses. We understand that you don't want generic training that won't resonate with your clients or staff. Our work focuses on what you want to convey, we are invested in the concept of the transfer of knowledge, so to that end, we sit down with your subject matter experts and glean as much information as possible to turn that knowledge into curriculum. And the bespoke work doesn't stop there...Our business development team customizes our training and techniques to meet your team's unique needs. We teach your team how to uncover new business, market effectively, and provide excellent solutions, always keeping in mind the personalities and strengths of your team. We get to know how you think, so that our work responds to your needs. When we first got started in the marketing game, I was stumped by the audience conversation. It seemed so pointless to me, I mean, I felt like I knew our audience, so why did we need to spend time creating a persona of our ideal audience? Also, whenever we had a meeting to create our audience personas, I was unable to come up with a single descriptor, it was very frustrating. In an effort to save you from similar frustration, I would like to offer 5 ways to define your audience. shirt or business attire? Again, perhaps clothing choices seem unnecessary, but in order for you to have a person in mind, you need to have all of these questions answered. The details are what is important here. Give your persona a name and really start to recognize him/her in other people. If you are able to recognize your persona's attributes in other people, you will truly have a sense of your audience. Now that you have drawn your persona and have a strong sense of who he/she is, it is time for you to create a narrative as well. Try to describe your persona's family life and work habits. Ask yourself questions like what kind of family is my persona part of? Is my persona part of a family that values higher education? Does my persona desire a job that is very structured? Or, is my persona wanting a flexible workplace? You get the idea, you need to know how this person works and what his/her expectations might be regarding family life, workplace, and daily life habits. This might seem really difficult to ascertain, just remember that this is an internal exercise and it is only to help your marketing department speak to the right audience. Understanding your persona's goals will help you position your programs and courses effectively. Let's say that your persona wants to achieve a higher salary in the manufacturing industry. Perhaps you have a leadership program that has been recognized by area businesses as a nice stepping stone to achieve a management position...If you are speaking to a persona that is in the manufacturing industry already, you might decide to position your marketing language to identify with that industry and discuss how leadership classes will improve his/her chances of moving up in the company. This step is a bit more difficult, but it is important to spend some time thinking about what is holding your persona back from moving forward with his/her education. Consider your persona's economic standing, buying decisions, and family obligations. For example, is your persona likely to be the first one in his/her family to pursue an education beyond high school? Does your persona have a fear surrounding advanced education? What sorts of things might incentivize your persona to pursue a program? 5. Where Does My Persona Hang Out? Okay, we are on the last step...Let's brainstorm a bit about where your persona might hang out! Try to guess who might influence your persona? Do you think your persona would enjoy any specific podcasts or blogs? Make a list of all of the influencers in your persona's life. What kinds of books does your persona enjoy? What about online reading material? At this point, you should have quite a bit of information written down regarding your persona's likes, dislikes, habits, and behavior. You should feel comfortable describing your persona and answering questions about whether or not your persona likes this or likes that! Remember that you are actually writing a story when creating a buyer persona. And if you approach this more like a creative writing exercise, I think you will find it much easier to complete. We are offering a special pre-order discount if you sign up for an online class before April 15th. Want to learn How to Build a Revenue-Producing Contract Training Department? For the first time, we are offering an online course that offers a step-by-step process to get you on your way! We have experience working with over 90 different community colleges, helping them become revenue-producing entities. This course is specifically created for the continuing education market, we are not approaching sales from a corporate perspective, we are approaching sales with the foreknowledge of how Contract Training Departments work. Brian Mallory Will Teach Your Business Development Team How To Increase Your Revenue In The Contract Training Department! Check Out Brian's Video Below! Customization is the idea that learning is modified to meet the learner's style, perhaps even giving the learner the opportunity to change how content is presented. When we focus on offering a personalized journey for the learner, we take into consideration the individual learner's pace, perhaps even altering the offerings based on responses to activities. In the corporate environment, the intent is on identifying the areas that need improvement and pivoting the training to meet that identified need. Last year, the Bill and Melinda Gates Foundation and the Chan Zuckerberg Initiative jointly funded a 12 million dollar initiative to support new ways of tailoring classroom instruction in the K-12 environment. Since 2009, the Gates Foundation has given more than $300 million to support research and development of personalized learning. If the concept of personalized learning is expanded with the younger generation, the expectation will be that businesses will need to provide the same kind of nurturing to employees and clients as the workforce begins to accept recent graduates. So far, personalized learning has grown in popularity and sparked interest, but we have only just begun to see this trend in action. The idea of providing a learning path that integrates a person's interests, style of learning, responses to questions, and previously acquired knowledge is intriguing for the business learner. If we can create a learning journey that progressively builds on knowledge and keeps the learner's interests because we have personalized the curriculum to change based on interest, progress, or responses, then we are really nurturing and educating our employees and clients. Love Simon's message...We wrote about his TED Talk and one of his great books awhile ago on our blog, check it out here. Simon recently sat down on the Jordan Harbinger Show to discuss how the best companies are values-based. He believes that the best way to foster this idea is to be authentic at work and at home. At Erudite Ingenuity, we are big fans of discussing authenticity, think Brene Brown, James McCrae, and Barry Schwartz. I really liked when Simon discussed how a leader must take the risk to trust first...I think many good leaders do this naturally, but if we desire to become better leaders, it is a great message for intentional growth of our leadership skills. Simon goes on to discuss, "Why we all deserve (just) a styrofoam cup." Take a listen to Jordan's show with Simon and discover what he means. Simon's message is all about finding your "why," which incidentally is the basis of much philosophical writing and something we love to blog about. We all desire to know our why and the only way to understand what motivates us, what makes us who we are, and how to live is by looking inward. Do You Lead With Compassion? Ever since Chade-Meng Tan gave his TED Talk in 2010, compassion has become an important characteristic in the workplace. Are we comfortable discussing compassion? Webster defines compassion as "a sympathetic consciousness of others' distress together with a desire to alleviate it." I hope that exists in the workplace, but I am just not so sure. Maybe we have 'a sympathetic consciousness of other's distress,' probably because we can sympathize and in some cases, even empathize, with what people might be going through, but do our leaders and coworkers really have a desire to alleviate our distress? I think that some people recognize the importance of helping others alleviate distress, but how far are leaders willing to go? Oh, I so want to delve into the question of whether or not it matters if our reasons are selfless when we offer help, but that will have to wait for another day! Are compassionate leaders encouraging their teams to care about the greater good? Chade-Meng Tan tells us in his TED Talk that caring about the greater good is a key ingredient in creating a compassionate workplace. Companies that put an emphasis on caring for communities and have a passion for the greater good are quite successful at creating a workplace where people show they care about one another. Autonomy is also cited as a necessary component in creating a compassionate atmosphere. In my experience, autonomy requires a level of trust that some companies have difficulty affording to employees, but when companies let go of control and trust, people tend to flourish in their roles. Self-awareness and a focus on inner growth also plays a large role in creating a compassionate workplace. According to a recent article in the Harvard Business Review by Adam Robinson, a study of over 1000 business leaders found that leaders who led with compassion produced teams that were superior. "Teams led by compassionate leaders exhibited better intra-team collaboration, stronger commitment to the company, and far lower turnover rates than those led by less-compassionate leaders"(https://www.inc.com/adam-robinson/according-to-harvard-this-1-leadership-trait-separates-exceptional-leaders-from-rest.html). Take a listen to Chade-Meng Tan's TED Talk, he makes a compelling case for compassion and ends his talk with this wonderful quote! I love quick tips about how to improve your life, don't you? I like this list because it seems so counterintuitive...Sleep More, Quit Being Nice, Play More Video Games, etc. Did the author of this article consult with my 14 year old? It does bring up some interesting points and the overall sense is that we need to relax and spend more time just being, rather than the go, go, go lifestyle we are all so committed to these days. #9 "Quit trying so hard." It is no surprise that exercise is on the list, but I had to smile when I read #8, 'Don't Trust Yourself.' It is something we don't often think about, but it is so true, we are the best liars to ourselves, aren't we? I probably lie most to myself about my eating and exercise habits. That portion was very small, so adding another dollop of whipped cream to my peach cobbler won't ruin my diet. I ran three days last week, so I only have to run once this week. You can probably relate, right? The last two made me laugh out loud, I definitely need to take myself less seriously, smile more, and laugh! Give this article a read. It is always a good reminder to practice daily habits, check out this article. I especially like to rise early, it is always refreshing how much more can be done when establishing a morning routine. I have struggled with following the Pareto Principle, it seems like each year I remind myself to once again focus my efforts on the aspects of my business that produce the greatest results. So, this month, I am asking myself which 20% of my efforts are producing the best results. Another habit that I would add to this list is developing an understanding that we learn by doing, so getting our content out there or producing a work product is more important than tweaking and tweaking and never actually producing anything. One of my favorite authors and Ted Talkers! Brene Brown is inspirational, funny, and real. I was perusing our blog posts and realized I had never posted this amazing TED Talk. In 2011, Brene Brown's video went viral after she exposed how being vulnerable is a necessary component of finding happiness and joy. It really resonates with me because I think that our 'go-to' is often to respond with fear, instead of with "courage, compassion, and connection." Brown's words in this talk are so powerful and she really hits on the notion that our courage and willingness to be vulnerable is what opens us up to a life filled with joy. I have to say that vulnerability has never really sat well with me, I like words like strength, power, resilience, etc. The idea that being vulnerable was the surefire pathway to finding happiness and joy sounds counterintuitive to me. Brown's examination of this subject is compelling and convincing, she frankly discusses how she pushed back on the notion of becoming vulnerable and found that letting vulnerability in led to a fuller and happier life. Take a listen today! One of Brene Brown's lesser known books should really be pushed to the forefront with this #TimesUp movement. She published Women & Shame in 2004, however the notion that shame shapes our behavior and damages our spirit is a timely subject. Take notes, remember stuff…wipe it clean! We are avid users of sales and marketing tools...they help us grow our business and provide great automation. 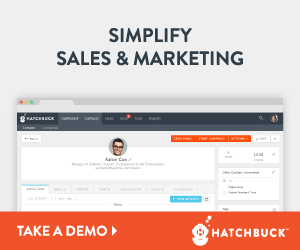 Currently, we are using Hatchbuck, a great sales & marketing software that automates your sales and marketing efforts overnight. Its CRM, email marketing and marketing automation tools give me everything I need to turn emails into conversations, website visitors into handshakes, and customers into raving fans. Let me know what you think! We write quite a bit about learning and the importance of challenging oneself...We can't help it, our background is in higher ed teaching, so we love to talk learning whenever we get the chance. In this TED Talk, Bernie Dunlap revels in our "insatiable curiosity" and an "irrepressible desire to know" as driving forces of what makes us want to learn and learn and learn. Mr. Dunlap's talk is inspiring and concludes with these wise words from Mahatma Gandhi, "Learn as if you'll live forever." About a month ago we shared an article and our thoughts about the importance of learning in the workplace. Learning in the workplace is often undervalued, however studies have shown that the best managers focus on training employees and encouraging learning. Bernd Vogel, Director of Henley Centre for Leadership at Henley Business School notes, “L &D is often seen as a ‘token’ activity and that is the underlying philosophy that top managers have about it." Learning & Development professionals need to possess the confidence to impact how employees learn and grow in the workplace. The notion of constantly improving, rather than simply focusing on what one needs to know to do his job today, is the real value in empowering a Learning & Development department. At Erudite, we believe strongly in learning in the workplace and in this crazy, fast-paced world, learning has never been easier...or has it? Sometimes, the onslaught of information is simply overwhelming. For example, I will be scrolling through Twitter with my business hat on and stumble across a post about Whitman's poetry, then all of the sudden I seem to be interested in poetry, but of course Whitman sparks a love of nature, so then I am searching for my next hike. You get it, right? How much does feeling empowered matter? Lately, I have been reading quite a bit about the importance of empowering employees…This notion resonated with me because as consultants we come across many different types of employees in many different roles. The ability to empower employees seems to be a skill that must be honed by leadership. So, I asked myself, ‘How do you empower employees?’ Empowerment is defined as giving someone the authority or power to do something. I am not surprised that a recent report stated that today’s employees want ownership over their roles. In 2006, the Gallup Organization reported that companies who empower their employees experience 50% higher customer loyalty. I think that most people believe that with clearly identified goals, they should be the architects to design how those goals will be achieved. If we provide flexibility to employees regarding where they work and how they work, will the result be better? I think the research supports that the results will exceed our expectations. Letting go of this type of control is difficult. When we witness other companies embracing a workplace that is freer and encouraging out-of-box thinking, we praise their ability to trust their employees and let them shine. LinkedIn’s CEO, Jeff Weiner, shared some of his career advice recently, “Inspire, empower, listen & appreciate. Practicing any one of these can improve employee engagement; mastering all four can change the game.” Successful leaders are typically good decision-makers, let’s face it, they make a lot of decisions each day, but that doesn’t mean that successful leaders have content employees. A leader who fosters a workplace where happiness, loyalty, and contentment are the desired goals is a leader who has the ability to step back and allow employees to make decisions and explore new ideas without her consent or input. Employees want to feel trusted and valued, so if leaders learn to let go of the reins and empower their employees to be innovative in the workplace, the results will be stellar! Consistency…How much does it matter? We are big fans of process improvement, automation, and basically anything that keeps us on track to meet our goals. We aren't just talking about business goals either, we like to apply these principles to our personal lives as well. So, when we stumbled upon this article, Five Tips for Achieving Consistent Success, we were intrigued and excited to dig in and understand what it takes to achieve success and keep it! To some, the idea of consistently repeating the same process day after day may seem boring, but we know that it garners results. When you create a process for your daily sales activities, your consistent behavior will lead to success. We especially liked the part of the article when the author noted that a "consistently successful people assume a dual responsibility: they are the architects and builders of their lives. Architects create blueprints; consistently successful people develop life-design strategies." You get the picture, you need to design the path to success and then work towards turning that design into a reality. Click here to read article! Gschwandtner, G. (2017, September). Five Tips for Achieving Consistent Success. Selling Power. Copyright text 2018 by Erudite Ingenuity.